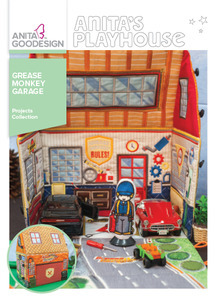 The Grease Monkey Garage is great for toy cars, and even comes with its own puppet mechanic. This fold-up playhouse is ideal for storing and toting toys to Grandma’s house! Try out different appliqué techniques like standard, puffy, and organza overlay to create this 3-dimensional garage. It’s unlike anything you can buy in stores! 18 different quilt blocks create both the interior and exterior of the garage. The blocks are then stitched together to create a fold-up garage. Take your sewing skills and creativity to the next level and create a unique gift any little boy will love! 18 panels in 4 sizes each (hoop sizes range from 6” x 10” to 9.5” x 14”). 1 mechanic in 1 size for 5” x 7” hoop. Also includes 3 stiffener templates to stabilize your garage.